Mongolian BBQ Tempeh: GF Vegan, Allergenless Opt | Bite Me. I am so delighted to share one of the tastiest Vegan recipes I have ever eaten! 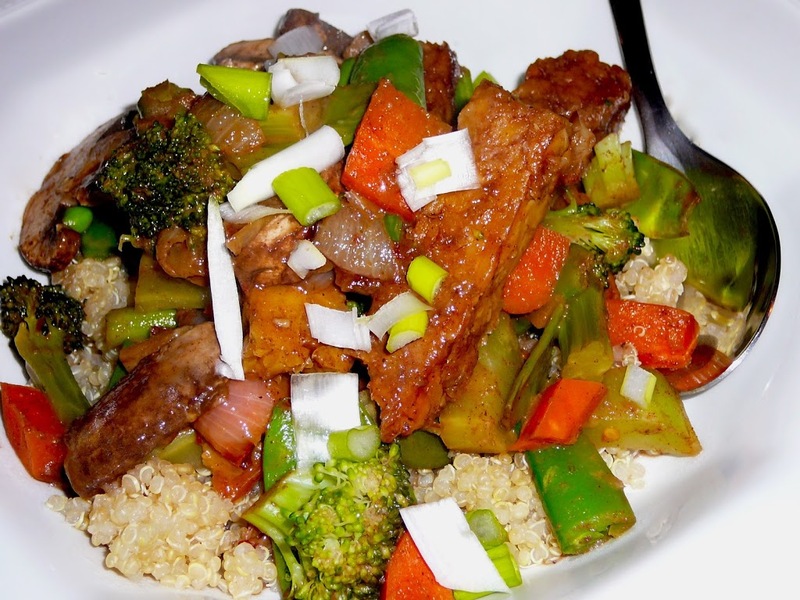 It’s a vegan twist on the classic Mongolian BBQ Beef= Mongolian Tempeh stir fry. Now for all of you who just shut off when I said the word ‘vegan’, I want to assure this isn’t anything like that bland tofu dish your hippie friends brought to a potluck that made history as the worst debauchery of tofu cuisine. It’s about as far from flavorless, texture-less vegan-nightmare foods you could imagine. 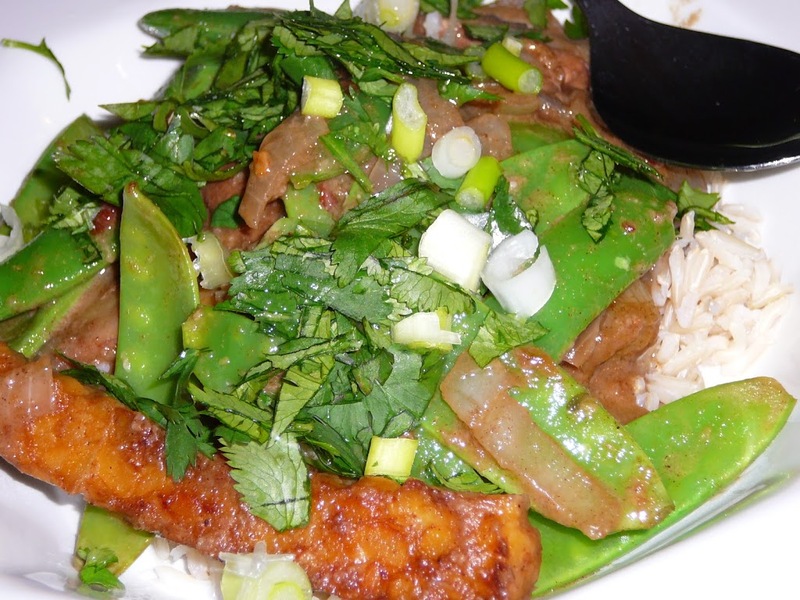 This dish has rich, complex flavors thanks to the spicy sauce, crispy veggies and yummy tempeh. I assure you, with all this yumminess in a bowl, you won’t miss animal-based proteins at all. And you might even like the veggies you don’t usually like when covered in this sauce. 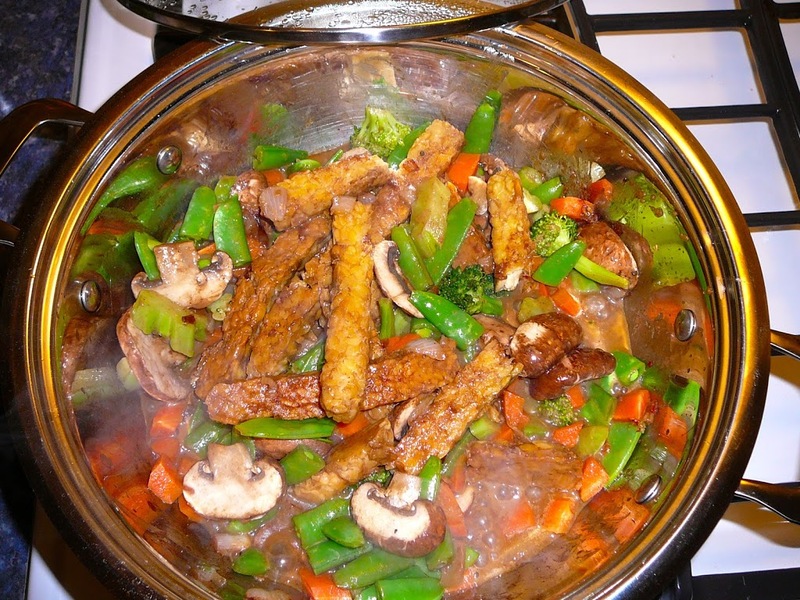 Tempeh is made from fermented whole soybeans (or other legumes! ), unlike tofu which is more processed and doesn’t contain the whole bean. Tempeh takes on the flavor of sauces beautifully and has a meaty texture that you can really sink your teeth into, but is still easy to chew. Essentially, it’s the perfect protein. 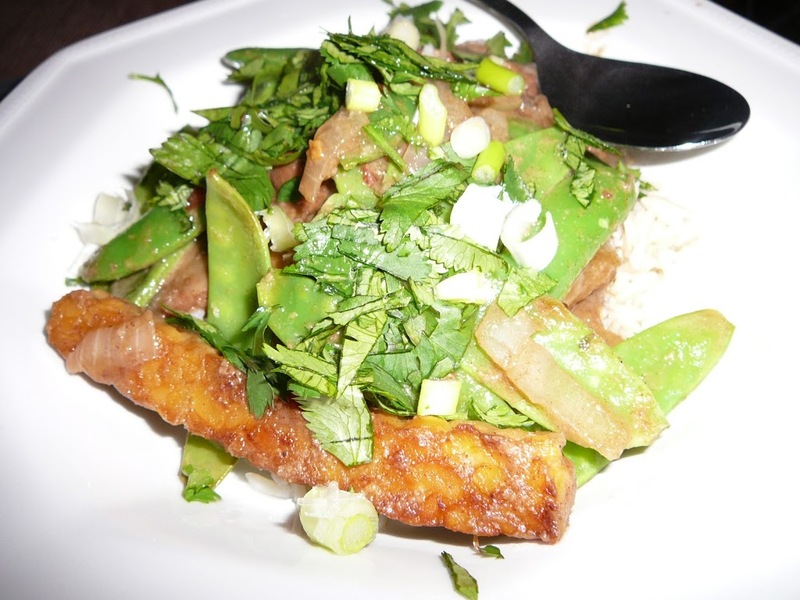 If you haven’t tried tempeh before, I think you will be wonderfully surprised when you have your first bite of this phenomenal dish. 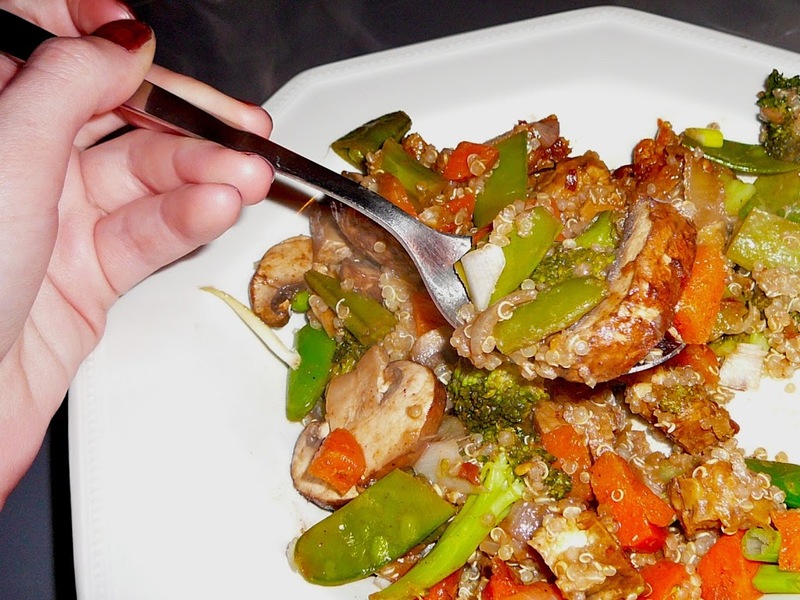 If you’ve tried it and disliked it, this stir fry will rekindle your love! It is so well seasoned and spicy and saucy that you won’t believe your eating something so healthy! My tummy is feeling much better lately…great enough to eat spicy things! This is the second time this week we’ve made this dish, and we made it last week too. I’m really excited about having the leftovers for dinner tomorrow. Sigh…can you tell I’m a little obsessed?!?! I’ve broken the recipe down into steps, which follow the ingredients, and included the ingredients separately to make natural ‘faux hoisin sauce’, to enjoy with other recipes. 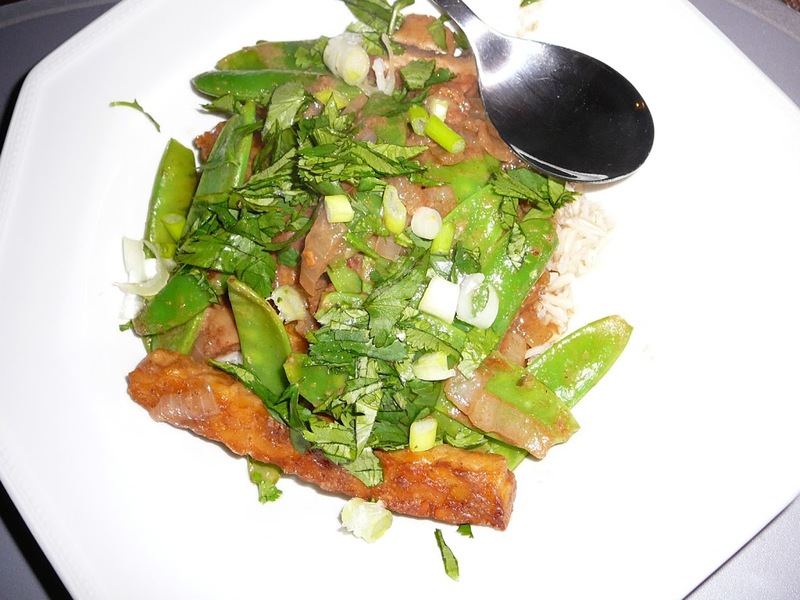 This recipe was inspired by ‘Chloe’s Kitchen‘s’ recipe of Mongolia BBQ Seitan. Seitan is a wheat-based protein similar in texture to meat, and so we’ve heavily adapted this yummy to make it free of common allergens like wheat/gluten, dairy, eggs, and processed sugars (and potentially soy-free). The original recipe calls for hoisin sauce, which consists usually of soy sauce, sugar, caramel food coloring and flavoring/spices. Ick! I found a recipe for creating a delicious ‘faux-hoisin sauce‘ using nut/seed butter and soy sauce. I’ve included it in the ‘sauce’. Enjoy this healthful, spiced, delicious recipe atop brown rice or quinoa. soy tempeh & quinoa = magic. everytime. I’m going to be honest. I’m not a measurer. I’m not a follow the recipe by the book sort of person. I usually actually measure vinegars and lemon juices, but for the rest, I throw in a dollop and then smell the resultant concoction. Does it need more lemon juice? I throw in a titch? It needs more Spice! In goes a little more hot sauce. That’s how I roll, partly because I’m too tired to measure everything exactly, and partly because I’m a taste-and-adjust sort of cook. Do whatever makes you feel comfortable. And as long as you are relatively close to the amounts listed, you should be peachy. Learn to guestimate. It takes practice to get comfortable knowing what a 1/2 teaspoon is compared to whole! This recipe comes together faster than it looks. Bring out everything in advanced…save yourself all the trips back to the fridge! Below, I’ve broken down the steps into manageable steps. The italicized ingredients are the recipe for making faux hoisin sauce, so if you can find a natural hoisin, substitute it for this made-from-scratch recipe. Use 1/2 cup of store-bought hoisin. add in any veggies you have on hand! broccoli, snap peas, snow peas, carrots, bell peppers, zucchini, frozen peas, bok choi…any vegetables work beautifully! = 4 cups or more if making a double batch! 1. Whisk up 1/2 cup ‘faux hoisin sauce‘ (or naturally sweetened hoisin sauce). It will not mix well, but that’s just fine. Once it goes into the wok/fry pan you won’t notice to isn’t emulsified. Whisk faux-hoisin, water, soy sauce, sugar syrup, lemon juice and chili-garlic sauce in a small bowl. Set aside. Heat oil over medium high heat in a large skillet. 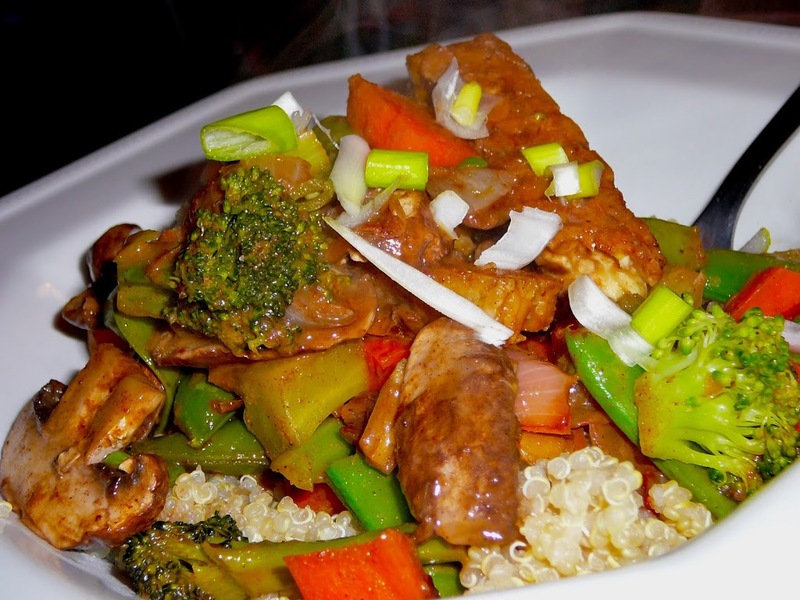 Stir fry mushrooms and seitan until lightly browned and mushrooms have released their juices. Add Spice Mixture and cook a few more minutes. Add in harder vegetables (carrots, broccoli etc) until they begin to cook, softening a little. Add the sauce and snow peas and reduce heat to medium. Let cook until sauce has thickened, which might happen quite quickly. Remove from heat and sprinkle on top scallions and cilantro and then serve over the rice. Allergen Check: Want to make this recipe ‘free’ of certain allergens? Make sure you read these tips before choosing ingredients, particularly if the person you are cooking for has allergies! When I use common allergen foods that I am not personally allergic to in my own cooking, I make sure to use a clean spoon when dipping, say, into the peanut butter, and make sure that spoon either goes in my mouth :D, or directly into the sink, not into the jam jar or butter, for instance. Using clean implements is a good practice anyways.